Hello Linux Geeksters. Some party developer has created Debian-Mate, a Debian Wheezy derivative system coming with Mate 1.6 as the default desktop environment. Since Mate 1.8 has been recently released, it will be available via the default repositories soon, most likely. For those who don’t know yet, the Mate desktop environment is a fork of the good old GNOME 2, developed by the Arch Linux team, very popular among both the Arch Linux and Linux Mint users. Mate 1.8 will come with important changes, including support for GTK+3 and Wayland, Samsung and Intel’s graphical server. 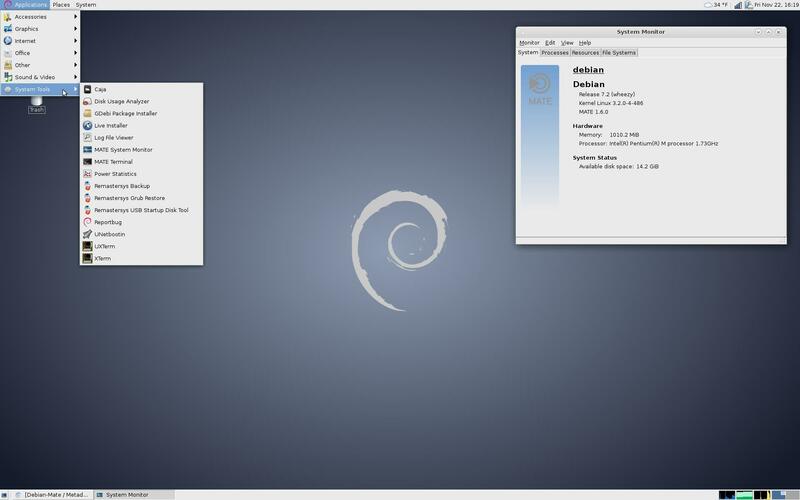 According to the project’s site, Debian-Mate can be used only as a Live System or installed on the hard disk. It uses Kernel 3.2 and does not require high-end hardware specs and so, it is ideal for modest computer and laptops. Also worth mentioning, Debian-Mate has the following apps already installed: LeafPad, PCManFM, GDebi, RemasterSYS and Unetbootin. If you are using Dell Latitide D600 or Dell Latitude D810, the WiFi drivers are available via the default repos, so you should not have any issues with the wireless card, on the two Dell products. Point Linux is is a well respected Debian Wheezy distro with the Mate desktop. Well worth checking out for anyone interested in the above welcome article.